The story of the crest and flag commenced during the life of the first House of Assembly when the Select Committee on Constitutional Development under the Chairmanship of the late Dr. John Guise called upon the people and schools throughout PNG for submissions about their country's flag. Hundreds of entries were submitted which, due to time restraints, were handed over to the Second Select Committee of Constitutional Development under the Chairmanship of the late Paulus Arek. Armed with this information The Committee in October 1970 had its executive staff analyse these designs to find the most suitable colours and symbols for a crest and flag. They found the popular colours were gold, green and blue and the symbols - birds, drums, spears and stars. This information was passed to Mr. Holman, an artist with the Dept of Information & Extension Services, for him to design a crest and flag using these colours and symbols. 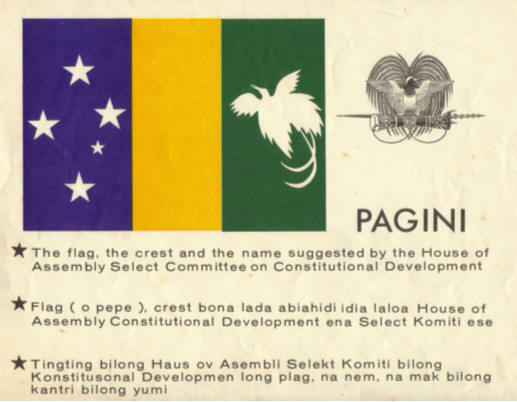 The committee ran with Mr. Holman's designs, a tricolour flag in green, gold and blue with the Southern Cross and a white bird of paradise superimposed The design was shown to the house of assembly on the 17th November 1970. The Committee will also seek the people's views on a flag and a crest. The flag and crest do not represent the ideas of one single person but rather have been designed taking into account the overwhelmingly popular colours, designs and ideas submitted by the people to your Committee. The BLUE represents the islands of our country and the sea, which surrounds them. The Cross lies above our whole country and guides our people in their travel on land and sea. The GOLD represents the coastal areas of our country, its past and future mineral wealth and unity. The GREEN represents the mainland and highland areas of our country and a Bird of Paradise, our unique bird, is turned towards the islands to represent one unified country. Mr Speaker, your Committee proposes to make an extensive tour of the Territory in January and February 1971. The people will be shortly notified when the Committee will be visiting their areas and will be provided with sufficient time to think about and prepare answers to the Committee's proposals, the main ones of which I have outlined in this statement. The Committee divided into two groups to tour the country in Jan/Feb 1971. As Deputy Chairman of the Select Committee I led one of the groups. The people universally accepted the crest although there was some parochial discussion about the design of the spear and drum. Susan replaced the tricolour by making the lower segment of the flag black with the stars of the Southern Cross in white. The top segment was red with the stylised bird of paradise in gold. Susan described the colours as those most commonly used by the people in their traditional ceremonies. The Committee next met in Port Moresby on the 1st March to consider the findings from its fact finding tour and finalise its report. Both groups found that that the proposed flag was not acceptable to the people as the flag for a future independent Papua New Guinea and decided to recommend one of the alternatives submitted to the committee during its tour. The choice was narrowed down to two designs. Susan's design I had already presented to the meeting. The other, somewhat larger, from a New Ireland group, was submitted by Mr. Wally Lussick. The Committee adjourned that evening without having come to a decision. I felt a little despondent, as I needed more than a page from an exercise book to do full justice to Susan's design. That evening Ross Johnson took the initiative and had his wife, Pat, put Susan's design onto a piece of cloth slightly larger than a tea towel. When this was shown to the Committee next day a consensus was soon reached. Ross & Pat's flag gave support to my presentation and the committee accepted Susan's design. "50.The crest suggested by your Committee is acceptable to the majority of the people. Many groups particularly in the New Guinea Islands region, submitted that some object representing their particular area be represented on the crest but it would not be practicable to include a representation from all areas on the crest. As there was widespread support for the crest as it stands, your Committee recommends that it be adopted." "51.The Committee suggested a flag for the country and showed it to the people on its recent tour. Your Committee received numerous representations to either alter the suggested flag or replace it. Because of the wide variety of views about the colour and design of the suggested flag, your Committee has decided to choose one of the submissions made to it on its recent tour." "52.The Committee has chosen a design submitted by a young Papuan girl named Susan Karike, In her submission to the Committee Susan described the colours of the flag as being the colours most commonly used by our people in their traditional ceremonies. 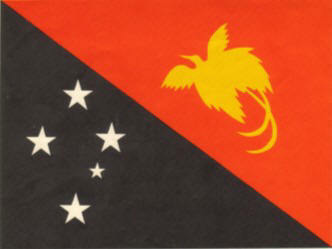 The Committee recommends that this flag be adopted as the flag for Niugini"
Evan Evans Pty Ltd of Melbourne supplied the first Papua New Guinea flag. I offered it to Dr. John Guise, Speaker of the House, to fly at the House of Assembly. He gracefully refused the offer as he thought it was premature. Mr. Les Johnson, the Administrator flew this flag in front of his office in Konedobu. It was the first PNG flag to be flown in the country. 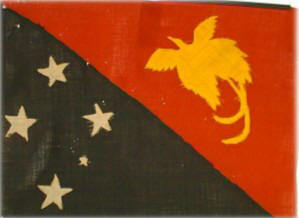 I visited PNG in August 2003 and noted the respect shown to their flag. This reinforced that the decision we made was the correct one.